Bosses at Ardbeg – the iconic whisky distillery on the remote island of Islay – are urging whisky aficionados to snap up their annual Limited Edition Ardbeg Alligator…before it’s too late. Described as a “whisky with bite”, it is hoped Ardbeg Alligator will go on to emulate the success of last year’s limited edition – Ardbeg Supernova – which not only sold out in record time but also won the coveted Scotch Whisky of the Year award. 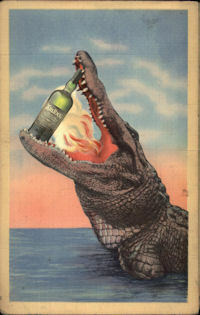 Ardbeg Alligator is the result of experimentation carried out many years ago by the Distillery and its team headed up by Dr. Bill Lumsden, Head of Distilling and Whisky Creation. “Alligator Charring” describes the method of charring (or burning) the inside of the oak casks before they are filled with spirit. The burnt wood staves take on the appearance of an alligator’s scales, hence the name. 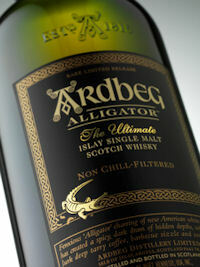 The heart of Alligator is spirit matured in ‘Level 4’ casks - the most intense type of charring you can achieve. Lumsden said: “Since we bought and restored the Ardbeg Distillery we have undertaken lots of experiments, laying down spirit in different types of casks. This began back in the late 1990s and Alligator is a good example of one experiment that has definitely worked. Ardbeg prides itself on being the ‘Ultimate Islay Malt Whisky’. Established in 1815, Ardbeg is revered by connoisseurs around the world as the peatiest, smokiest and most complex of all the Islay malts. Despite its smokiness, Ardbeg is renowned for its delicious sweetness, a phenomenon that has affectionately become known as ‘the peaty paradox’. During the 1980s and 1990s, Ardbeg suffered from an uncertain future and it was not until the brand was purchased by The Glenmorangie Company in 1997 that the Distillery was saved from extinction. Since then, the Distillery has risen like a phoenix and today Ardbeg is well established as a niche, cult malt, with a passionate following. Ardbeg was voted Scotch Whisky of the Year three years in a row (2008-2010) by Jim Murray’s Whisky Bible. Ardbeg Alligator has been bottled at 51.2% ABV and as with all Ardbegs is non chill-filtered for extra texture and mouth-feel.